Fresh raspberries and dark chocolate are an unbeatable combination in these mini-tarts. Raspberries are at their peak right now and it’s a real treat to use fresh berries in pies and tarts. Local raspberries can be found at roadside stands, farmer’s markets and most supermarkets by the end of August. However, they are very delicate and don’t store well so they should be used within a day of purchase. These mini-tarts are very easy to make but they do require a bit of time between steps so the ingredients can cool. They’re great for entertaining because they can be made in advance and the shells won’t get soggy thanks to a layer of chocolate protecting the tartlet shells. You could also make one large tart instead of mini tartlets. Makes 8 mini tarts (about 3″ each in diameter). Recipe can be doubled or halved as desired. 2 ounces / 57 grams dark chocolate (70% cocoa). Preheat oven to 375 degrees Fahrenheit. If using frozen shells*, let them stand at room temperature for 10 minutes. Use a fork to prick the bottom of the shells. Place on a baking sheet and blind bake (ie. bake the empty shells) until golden brown, about 12 to 15 minutes. *If you are using freshly made pastry, line mini-tart pans or a muffin tin with the pastry and crimp the edges. Prick the bottoms with a fork and bake until golden, about 10 minutes. Remove baked pastry shells from the oven and let them cool completely. They can be baked a day or two in advance and kept in an air-tight container until ready to use. To prepare the chocolate layer: Melt the chocolate in a double-boiler or in the microwave in one-minute increments. Spoon some of the chocolate into each tart shell and use a pastry brush to coat the entire inside of the shell. Refrigerate the shells until the chocolate has hardened. To make the raspberry filling: In a medium saucepan, add 2 cups of raspberries, 2 Tablespoons of water and the sugar. Bring to a simmer on medium-high heat. Cook until berries begin to soften, about 8 minutes. Lightly mash berries with a spoon. In a mug or glass measuring cup, mix together the cornstarch and water until smooth. Pour into the saucepan of raspberries and stir to combine. Cook raspberry mixture until it becomes glossy and thickens, about 5 to 7 minutes. Remove the raspberry filling from the heat and let cool slightly. Spoon filling into the chocolate-lined tart shells and refrigerate shells until the filling is cool and firm. 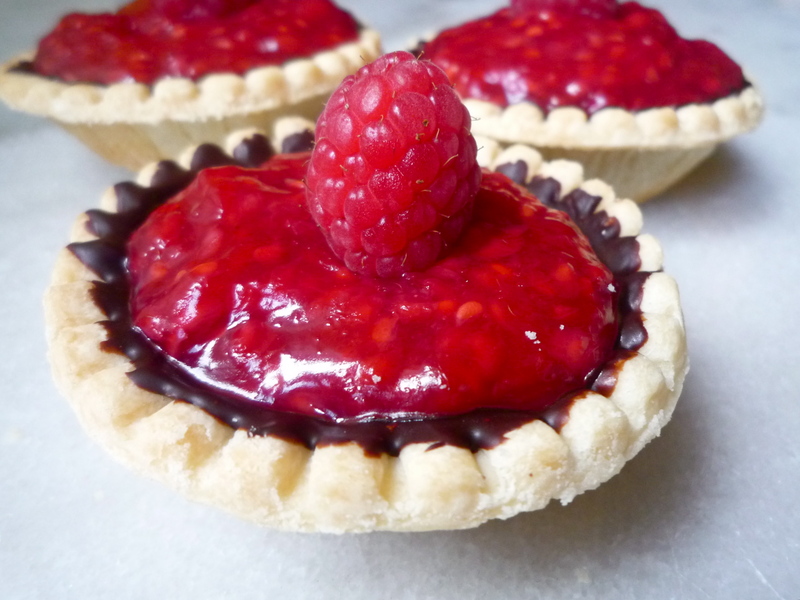 Garnish tarts with fresh raspberries and serve. Raspberries are at their peak in most areas right now so it’s time to enjoy these sweet berries while we can. Frozen and greenhouse-grown raspberries are available the rest of the year but nothing beats the flavour of fresh raspberries in season. Unfortunately, they are very delicate and spoil quickly so they have to be used immediately. Inspect them carefully for mold before using. (Note: Frozen raspberries can be used if making these out of season – don’t thaw the berries before adding to the recipe). Scones are a delicious way to start the day and when made with raspberries and white chocolate chunks, they become a decadent treat for a special weekend breakfast (they are very rich but delicious!). These scones are a bit more like a biscuit in consistency – they are not as dense and hard as many scones I’ve had. They can be cut into the traditional triangular shape or into circles if you’d rather not fuss. In a small bowl, add raspberries and 2 teaspoons flour and toss to coat berries. Set aside. In a separate large bowl, add 2 cups of the flour, sugar, baking powder and salt. Stir with a fork to combine. Cut the cold butter into small pieces and add to the dry ingredients. Using a pastry cutter or two sharp knives, cut butter into the flour mixture until it is thoroughly incorporated and the mixture looks like coarse crumbs. Add the white chocolate chunks and stir into the mixture until evenly distributed. In a mug or glass measuring cup, add 1/2 cup cream, the egg and vanilla and whisk with a fork until combined. Add to the flour mixture and stir with a large spoon until dough is moist. Add the raspberries to the dough. Using your hands, work the raspberries into the dough until they are thoroughly mixed in. Don’t worry about them breaking up – it will distribute the berry flavour through the dough. Lightly flour a clean countertop or pastry board. Turn the dough out onto the counter and knead for about 20 seconds. Form dough into a square about 1-1/2″ thick. Cut into elongated triangles (or you can just cut the dough into circles like biscuits). Line a baking sheet with parchment paper cut to fit. Place the scones on the baking sheet, making sure the are spaced far enough apart that they’re not touching. Lightly brush the tops of the scones with remaining 1/4 cup cream (there may be a bit of cream left over). Bake for about 20 minutes or until the tops have lightly browned and the scones are cooked through (you can test the doneness by inserting a knife into the scone- if it comes out clean, they’re done). Serve with butter, Devonshire cream or lightly sweetened whipped cream. For an extra burst of raspberry flavour, serve with raspberry jam or jelly. Growing up in rural New Brunswick, we had a raspberry patch behind our house. I didn’t exactly enjoy picking them – if you didn’t want to get scratched to pieces you had to wear long sleeves and pants in the summer heat. However, they were so sweet and delicious, it was worth the trouble (my mom makes an excellent raspberry pie). Luckily, farmer’s markets and some supermarkets are now carrying locally picked raspberries, sparing my limbs the trauma of picking my own. 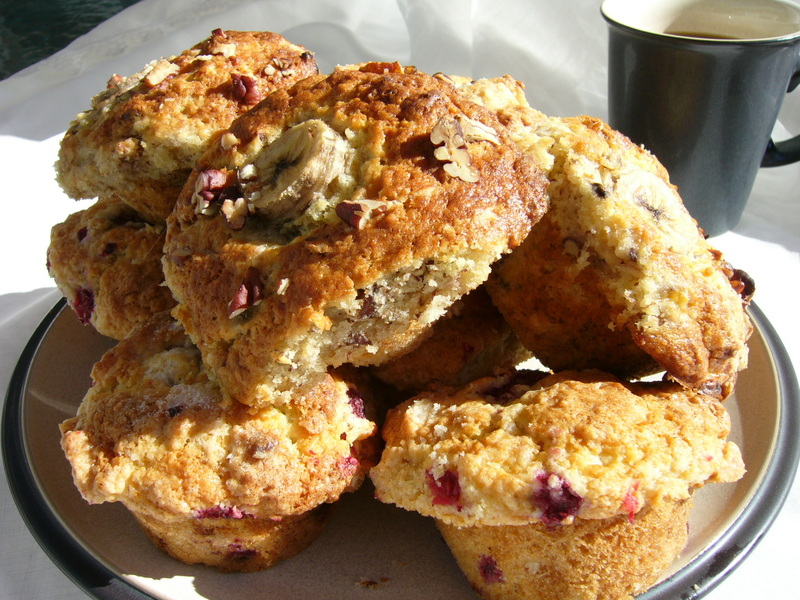 The secret to making big, bakery-style muffins is to fill the muffin tins up to the top of the cups. Be sure to grease the top of the tin as well as inside the cups because the muffin tops will puff up and cover the tin. Another helpful tip: if you freeze the raspberries spread out on a baking sheet lined with wax paper, the frozen berries will not bleed into the batter as much as fresh ones. In a large mixing bowl, combine 1-1/2 cups flour, 3/4 cup sugar, the baking powder, baking soda and salt. Stir to combine. Add wet ingredients: the eggs, oil and yogurt. Stir until batter is mixed together (it will be quite thick). 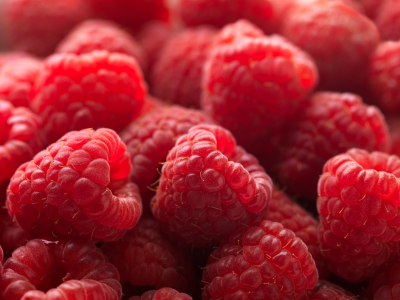 In a separate bowl, combine raspberries with 1 Tablespoon flour and 1 Tablespoon sugar. Toss to coat berries. Very carefully fold raspberries into muffin batter until they are mixed in. 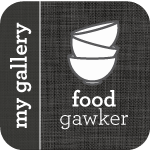 Spoon batter into muffin cups (fill halfway for 12 small muffins or fill to the top of the cups to make 6 large muffins). Sprinkle muffin tops with a little bit of sugar. For large muffins, bake for approximately 30 to 35 minutes, or until a knife inserted into the muffins comes out clean (reduce baking time for small muffins). Let the muffins cool in the muffin tin before removing – they are almost impossible to get out in one piece while they’re still hot!